What if I told you that I’m a serious Christian who thoroughly, enthusiastically AGREES with this graphic? Posted on an Internet atheism community, the message is probably a shot at followers of Jesus Christ (whom serious Christians believe is the Son of God). That said, I certainly don’t take any offence. 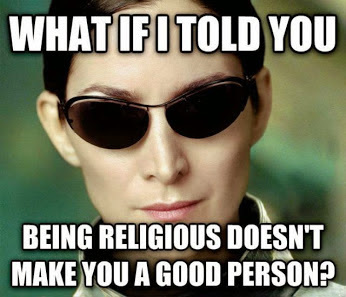 Being “religious” no more makes a person “good” than going into MacDonald’s makes one a Big Mac. In fact, I’ll go further and write that being “religious” is far more likely to make a person arrogant, petty, self-righteous and overwhelmingly judgmental. “But what happens when we live God’s way? He brings gifts into our lives, much the same way that fruit appears in an orchard—things like affection for others, exuberance about life, serenity. Compassion? A conviction that all of God’s creations (no matter how warped or broken they might be) are special? There’s precious little room for that in a person who’s busy being self-righteous and judgmental. Let me be clear: Christians are a long, long way from anything approaching “perfect”. There are still moments when I find myself spending more time opposing people and positions than supporting their right to free speech. That’s why I’m writing this essay for YOU to read. I want you to experience the same positive life change as me. I want you to know, like I know, that God loves YOU passionately and offers YOU the gift of His Son. I love what you said about church being a hospital for sinners, not a museum of saints. So aptly expressed, Frank! Blessings! But you are religious. You are a Christian and Christianity is a religion. Furthermore, the only source for info on Jesus of Nazareth is the bible, a religious tome compiled by the inventors of you religion/faith, the Catholic Church, at the instigation of Constantine. But this link merely outlines exactly what I point out. You would have no recourse to ”follow Jesus of Nazareth” without the religion that introduced him to the world. You would have no gospels if it were not for the Church that decreed there would only be four and compiled them. So you are a Christian and you adhere to Christianity. This is a religion. This you are religious and a member of a religion. It is as simple as that. Also, how can G-d offer me his son if his son is G-d? Can you explain this please, Frank. You are referring to the trinity, which describes God as one god in three persons: God the father, God the son and God the holy spirit. So you accept the Trinity but have no idea what it’s about? I thought this was for potential converts? How are you going to answer them if they ask you? Thanks for your comments. I would be very, very surprised if any “potential converts” asked questions about something they’ve likely never heard of. No one has so far and Frank’s Cottage has been in existence for three years and has been visited more than 30,000 times. “IN SHORT… Jews do not believe in a trinity. The Jewish idea of Gd is that Gd is One and Indivisible. Gd cannot be divided up into separate parts, where each part is unequal to each of the other parts, yet somehow they are one and the same. The Hebrew Scriptures describe Gd as an absolute One, but the Christian Scriptures describe Gd as divisible into three parts called a trinity. “In the Christians’ scriptures, Jesus at one point claims to have different knowledge than other parts of the Christian trinity. For example, Matthew 24:36, or Mark 13:32. In another verse, Jesus does not have the same power as other parts of the Christian trinity, for example, Luke 23:34. And in Matthew 26:42, Jesus’ will is not the same as the will of the Father. Indeed, Jesus often contrasted himself with the Father, for example, in John 14:28, or Luke 18:19. Furthermore, Jesus supposedly said that the punishment for blaspheming against one part of the trinity is not the same punishment for blaspheming against another part of the trinity. See? The Christian Church made it up to combat the accusation that Christianity was likely polytheist and to sort out the hierarchy issues surrounding Yahweh, his supposed child, Jesus of Nazareth, and the Holy Spirit.. Thanks for your thoughts. Since you are so interested in going in-depth on this point, I refer you once again to the Christian Apologetics & Research Ministry (http://carm.org/). Debating issues like this are absolutely not part of the mission of Frank’s Cottage. So this conversation is finished. Unfortunately, being religious makes millions into very bad persons. Their religion incorporates abominations and gives rise to acts of utter evil. A completely enlightened person, who tries to live a life of positivity and love, is a better example of ‘good’, whether they believe in a god or not. 1. Who decides what is “positivity”? And does it change with every tide of new cultural thinking? 2. What about the bigger questions: why are you here? What happens to you when you die? All the positivity in the world still leaves those questions hanging in the air. 1. Those with true intellectual ability decide that, and yes, it will advance as knowledge, culture and thinking progress (which most religions have failed to do). 2. The reasons given by religions for being here and what happens when you die amount to no real reasons at all. They make no sort of sense. They are actually, with incredible hubris, built on the supposition that all of creation is centred around human beings and that a Supreme Being must just be a superior version of mankind. Fairy stories carry a great deal more credibility. Atheism, on the other hand, is denying purpose and progress which is evident in everything that exists, and the no-answer it gives takes the blinkered view that there simply isn’t one. On balance, religions have the high ground for deciding purpose exists, even if they do fall far short of plausible theories as to why. Thanks for your comments. Your first response sounds downright scary to me. So people who are are judged to not have “true intellectual ability” are shoved to the sidelines? How long before they become considered less worthy of other things? Yikes. 2. I have no comment on “religions”, since I have no interest in religion. I have an interest in faith. Some may not see a difference. I most definitely do. Faith requires a faith in something. If that is not in a religion, what is it? Faith in God, period? Or faith that everything will turn out for the best? Faith in God is part of religion, but religion incompasses rules, regulations and, inevitably, self-righteous, hard-hearted judgementalism. So what you are suggesting is faith in God without being tied down to the trappings religion gathers? That makes sense – except that blind faith without questions of the whys and wherefores is still abdicating our intellectual capacity. Regrettably, the evidence seems sadly lacking. All of it really boils down to being a Constantine construct. Thanks for your opinion. The Christian Apologetics & Research (www.carm.org) goes into considerable detail about evidence for Christianity. Hey Frank you have written a good post here and I really liked it. @Ark, hey thanks for sending me to some good reading. You are missing the point of the post by the way. I say that as well. I am NOT religious; I am a Christian. No religion, no set of liturgy or rituals, and no amount of good works will ever save me from my fallen condition. That is religion. Christianity is realizing we are fallen in the sight of a Creator God, repenting of that sin, and accepting the totality of the price Jesus paid to redeem us from that sin. 2. You follow and accept the Nicene Creed. Officially formulated in 325 ( and later amended in 350, I think, to kill off Arianism) by the Church that actually invented your religion, Christianity; overseen by Constantine the Great (sic) who the Church made a Saint because of how he devised a method to make Christianity acceptable. 3. Your version of Christianity, Faith not Works is based on the Protestant version of your religion, Christianity, and was one of the reasons Luther broke away from the Catholic Church. 4.And like Frank, you also go to Church for heaven’s sake! There are more but I don’t want to burden you with too many facts. You’ll just have to research in your own time. Good grief, you make me laugh right across the internet, Wally.